NISTOR, C. G. , SCUTARU, G. , CAMPEANU, R. , CERNAT, M.
The paper presents the original SV-100 platform that enables low-cost and very high accuracy determinations of noise and vibration levels. The aim of the proposed platform is to achieve an effective integration of the two topics of this analysis: vibrations and noises. To the best of our knowledge, no low price, dedicated compact platform with embedded measuring instruments exists. For proving the practical utility of the proposed platform, two induction motors of 7.5 kW and 11 kW, respectively, in single-layer winding, at 1000 rpm, with IE3 premium efficiency were analyzed. This analysis is required because, according to IEC60034-30 standard, the IE3 efficiency standard has become mandatory for induction motors of rated power greater than 7.5 kW. Therefore, in order to improve the motor operating efficiency, the power losses caused by noises and vibrations have to be reduced. Several variants of supply were studied, i.e., by the three-phase 50 Hz network and by a three-phase inverter at 40, 50 and 60 Hz, respectively. The experimental determinations of noises are presented comparatively, by using a Bruel&Kjaer sonometer and by using the new platform SV-100. The results are compared with the IEC60034 standard. S. Nau, H. Mello, "Acoustic noise in induction motors: Causes and solutions," IEEE 47th Annual Petroleum and Chemical Industry Conference, San Antonio, Texas, U.S.A, pp. 253-263, 2000. A. Nicolaide, "Electrical machines. Theory, Design", (in Romanian), Vol. 1., pp. 431-520, "Scrisul Romanesc" Publisher, Craiova, Romania, 1975. I. Peter, Gh. Scutaru, C.Gh. Nistor, "Manufacturing of asynchronous motors with squirrel cage rotor, included in the premium efficiency category IE3, at S.C. Electroprecizia Electrical-Motors Ltd Sacele," Proc. of the 14th International Conference on Optimization of Electrical and Electronic Equipment, Brasov, Romania, pp. 421-425, 2014. T. D. Graybeal, "The nature of vibration in electric machinery", Electrical Engineering, Vol. 63, Issue 10, pp. 712-718, 1944. F. Zhang, N. Tong, F. Wang, "Analysis of vibration modes for large induction motors," Proc. of the International Conference on Electrical Machines and Systems, Vol. 1 pp. 64-67, 2005. Z. Q. Zhu, D. Howe, "Improved methods for prediction of electromagnetic noise radiated by electrical machines," IEE Proc. on Electric Power Applications, Vol. 141, Issue 2, pp. 109-120, 1994. S. P. Verma, "Noise and vibrations of electrical machines and drives; their production and means of reduction," Proc. of the International Conference on Power Electronics, Drives and Energy Systems for Industrial Growth, Vol. 2, pp. 1031-1037, 1996. J. Le Besnerais, V. Lanfranchi, M. Hecquet, P. Brochet, G. Friedrich, "Prediction of Audible Magnetic Noise Radiated by Adjustable-Speed Drive Induction Machines," IEEE Trans. on Industry Applications, 2010, Vol. 46, Issue 4, pp. 1367-1373, 2010. E. Nakamae, H. Yamashita, K. Kaneda, Y. Ohnogi, K. Kagawa, "Noiseless variable-speed squirrel-cage induction motor," IEEE Trans. on Energy Conversion, Vol. 5, Issue 2, pp. 380-385, 1990. G. Rata, M. Rata, I. Graur, D.L. Milici, "Induction Motor Speed Estimator Using Rotor Slot Harmonics," Advances in Electrical and Computer Engineering, Vol. 9, Issue 1, 2009. V. P. Raj, K. Natarajan, T.G. Girikumar, "Induction motor fault detection and diagnosis by vibration analysis using MEMS accelerometer," Proc. of International Conference on Emerging Trends in Communication, Control, Signal Processing & Computing Applications, Bangalore, India, pp. 1-6, 2013. P. V. J. Rodriguez, "Current force and vibration based techniques for induction motor condition monitoring", pp. 27-45, PhD Thesis Helsinki University of Technology, Espoo, Finland, 2007. P. L. Timar, K. E. Hallenius, "Some notes on the necessity to extend the vibroacoustical tests of rotating electrical machines used in variabile-speed drives," Conference record of the 1988 IEEE Industry Applications Society Annual Meeting, Vol. 1, pp. 124-128, 1988. B. Zhu, U. R. Prasanna, K. Rajashekara, H. Kubo, "Comparative study of PWM strategies for three-phase open-end winding induction motor drives," Proc. of the International Power Electronics Conference, Hiroshima, Japan, pp. 395-402, 2014. C. Harlisca, L. Szabo, L. Frosini, "Diagnosis of rolling bearings faults in electric machines through stray magnetic flux monitoring," Proc. of the 8th International Symposium on Advanced Topics in Electrical Engineering, Bucharest, Romania, pp. 1-6, 2013. C. Gh. Nistor, Gh. Scutaru, I. Peter, "Determination of magnetic noise for a 7.5 kW three-phase induction motor fed directly from the grid," Proc. of the 14th International Conference on Optimization of Electrical and Electronic Equipment, Brasov, Romania, pp. 431-436, 2014. C. Gh. Nistor, "Analysis of noise and heating for three-phase induction motor fed by inverter," Proc. of the 14th International Conference on Optimization of Electrical and Electronic Equipment, Brasov, Romania, pp. 389-396, 2014. A. Ruiz-Gonzalez, F. Vargas-Merino, "Application of Slope PWM Strategies to Reduce Acoustic Noise Radiated by Inverter-Fed Induction Motors," in IEEE Trans. on Industrial Electronics, Vol. 60, Issue 7, pp. 2555-2563, 2013. J. Seshadrinath, B. Singh, B.K. Panigrahi, "Investigation of Vibration Signatures for Multiple Fault Diagnosis in Variable Frequency Drives Using Complex Wavelets," IEEE Trans. on Power Electronics, Vol. 29, Issue 2, pp. 936-945, 2013. A. C. Binojkumar, "Experimental Investigation on the Effect of Advanced Bus-Clamping Pulse width Modulation on Motor Acoustic Noise," IEEE Transactions on Industrial Electronics, Vol. 60, Issue 2, pp. 433-439, 2013. G. Ene, C. Pavel, "Introduction into vibrations and noises isolation technique", pp. 68-85, "Matrix Rom" Publisher, Bucharest, Romania, 2012. J. F. Gieras, "Advancements in electric machines," pp. 134-142, Rockford, Illinois, USA, 2008. 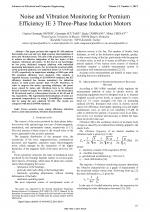 I. C. Rosca, M. Filip, "Damping ratio estimation of Three-Phase Induction Motor," Proc. of the 14th International Conference on Optimization of Electrical and Electronic Equipment, Brasov, Romania, pp. 405-408, 2014. I. C. Rosca, M. Filip, E. Helerea, "Three-phase squirrel-cage induction motor modal analyses. Theoretical and experimental aspects," Proc. of the 13th International Conference on Optimization of Electrical and Electronic Equipment, Brasov, Romania, pp. 606-611, 2012. M. Tsypkin, "Induction motor condition monitoring: Vibration analysis technique - a twice line frequency component as a diagnostic tool," Proc. of IEEE Conference Electric Machines & Drives, Chicago, pp. 117-124, 2013. R. Campeanu, M. Cernat, "Two Speed Single Phase Induction Motor with Electronically Controlled Capacitance," Advances in Electrical and Computer Engineering, Vol. 14, Issue 3, pp. 137-140, 2014. J. C. Malcolm, "Handbook of noise and vibration control", pp. 424-481, Wiley, New York, 2007. A. Metatla, S. Benzahioul, T. Bahi, D. Lefebvre, "On Line Current Monitoring and Application of a Residual Method for Eccentricity Fault Detection," in Advances in Electrical and Computer Engineering, vol. 11, no. 1, pp. 69-72, 2011. 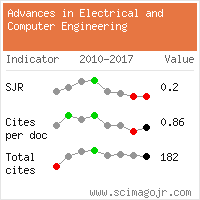 L. Mihet-Popa, "Current Signature Analysis as Diagnosis Media for Incipient Fault Detection," Advances in Electrical and Computer Engineering, vol. 7, no. 2, pp. 11-15, 2007. H. B. Ertan. N. B. Simsir, "Comparison of PWM and PFM induction drives regarding audible noise and vibration for household applications," IEEE Trans. on Industry Applications, vol. 40, Issue 6, pp. 1621-1628, 2004. S. P. Verma, A. Balan, "Measurement techniques for vibration and acoustic noise of electrical machines," Sixth International Conference on Electrical Machines and Drives, (Conf. Publ. No. 376), pp. 546 - 551, 1999. S. Baldizzone, C. J. Novak, N. C. Kar, "Experimental investigations of noise and vibration in electric machines," 2012 IEEE Transportation Electrification Conference and Expo, pp. 1-6, 2012. I. Hirotsuka, Y. Niwa, K. Tsuboi, M. Kawakami, "Experimental study of radial distributions of electromagnetic vibration and noise in three-phase squirrel-cage induction motor at no-load," in Proc. of the International Conference on Electrical Machines and Systems, ICEMS pp. 64 - 68, 2008. M. Janda, O. Vitek, M. Skalka, "Noise diagnostic of induction machine," 2010 XIXth International Conference on Electrical Machines, pp. 1-4, 2010. A. Danila, I. Margineanu, R. Campeanu, C. Suciu, "The Optimization of the single/two phase induction motor start-up with electronically switched capacitor" Proc. of Automation, Quality and Testing, Robotics IEEE International Conference, AQTR2008, pp. 450-453, Cluj-Napoca, Romania, 2008. I. Vlad, A. Campeanu, S. Enache, G. Petropol, "Operation Characteristics Optimization of Low Power Three-Phase Asynchronous Motors," Advances in Electrical and Computer Engineering, Vol. 13, Issue 1, pp. 87-92, 2014. A. Campeanu, I. Vlad, S. Enache, L. Augustinov, G. Liuba, I. Cautil, "Optimization of startup characteristics of medium power asynchronous motors with short circuit rotor," 2012 XXth International Conference on Electrical Machines (ICEM), pp 1387-1392, 2012. I. Vlad, A. Campeanu, S. Enache, M.A. Enache, "Aspects regarding optimal design of high power squirrel cage asynchronous motors," Proc. of the 13th International Conference on Optimization of Electrical and Electronic Equipment, pp. 503-508, 2012. National Instruments, "LabVIEW User Manual", 2013. Citations for references updated on 2019-04-21 23:40 in 227 seconds. Website conception, design and maintenance by Eugen COCA. Content updated on 28 Feb 2019. Site engine updated on 28 Feb 2019. This page was generated on the server in 0.076 seconds and loaded in your browser in > seconds.